Heaves in horses is one of the most prevalent lung diseases that can threaten your horse’s health. In this article I will be discussing heaves in horses, the causes, symptoms, preventions and cures so that you can offer the best care possible for your horse. Read on to find out more about heaves in horses. Heaves is a severe form of bronchitis than can have a substantial effect on the health of your horse, making it difficult for him to breathe. If your horse is suffering from heaves, his airway passages will gradually become obstructed by mucus and inflammation, making it increasingly difficult for your horse to breathe easily – even at rest. What Causes Heaves in Horses? Heaves is a disease commonly found in horses that are exposed to repeatedly dusty environments and poor ventilation. 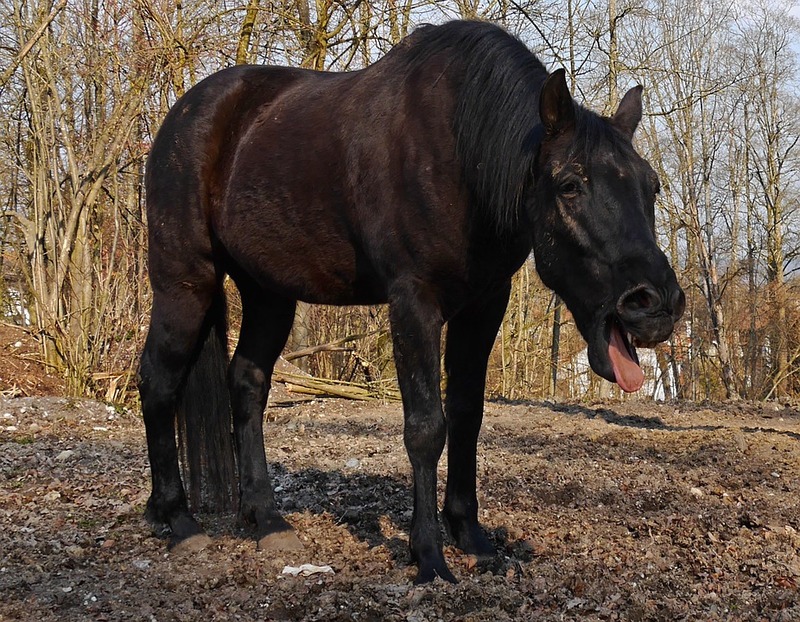 A horse that spends a lot of its time in a dusty environment will be breathing in dust particles that originate primarily from hay and can cause airway inflammation. However, heaves can also develop in horses that are kept predominantly outdoors. A horse suffering from heaves will first show symptoms around the age of eight years old. Symptoms of heaves in horses generally include excessive coughing and an intolerance to exercise. These are two of the symptoms most obvious and tend to be easily observed when the affected horse is in a closed environment, such as a stable. After a couple of years suffering from coughing, a horse with heaves will begin to show difficult breathing at rest. If the condition remains untreated and the environment the horse is in has not been changed, the horse’s breathing will become increasingly difficult as airway obstruction becomes more and more severe. As a result, a horse with heaves will lose excessive amounts of weight because he will find it difficult to eat sufficient amounts of food due to having difficulty breathing. So, you suspect your horse has heaves but how would this be diagnosed successfully? Firstly, heaves in horses should only ever be diagnosed by a qualified veterinarian. Your veterinarian will generally diagnose heaves based on the clinical history of your horse and his chronic coughing, intolerance to exercise and difficulty breathing even while resting. They will then decide on the best treatment for your horse. Veterinarians will be able to decipher any difficulty breathing by spotting any wheezing sounds in the lungs through a stethoscope. However, sometimes the wheezing sounds can be heard by simply standing next to the horse. Further tests, such as an endoscopic examination of the airway passages, will reveal any accumulation of mucus within the bronchi and trachea. A sample of this mucus will be taken to test for mature inflammatory cells. Because heaves in horses can be a result of allergies, your veterinarian may suggest allergy testing to determine the cause of the allergy/ However, although these tests rarely identify the specific cause of heaves, they can give you a better idea of what your horse is allergic to and what you should avoid exposing him to daily. Being informed your horse has heaves can be difficult to come to terms with. Although it is not known whether heaves can ever be completely cured, there are management techniques you can use to help reduce the symptoms you horse is suffering from. Decreasing your horse’s exposure to dusty environments is essential in the reduction of symptoms and the prevention in the progression of the disease. It is widely agreed that decreasing your horse’s exposure to dust is the best way to reduce the symptoms of heaves in horses. If possible, try to allow your horse as much time outdoors as possible and remove access to hay by replacing it with soaked hay, low-dust feed or pellets. To help encourage the drainage of mucus, feed your horse from the floor. Keep your horse’s stall well ventilated (even during the winter) and as dust-free as possible. When cleaning out the stables, remove your horses beforehand to remove any risk of inhalation of excess dust. Do not feed your horse from a round bale of hay as horses tend to burrow their face into the bale, causing exposure to excessive dust. Switch to a different form of bedding, such as rubber matting, that reduces the need for extra hay in your horse’s stall. Environmental management is the most effective way to reduce the symptoms of heaves in your horse and help reduce his symptoms. If your horse has heaves, I hope I have encouraged you by proving there are management techniques you can use to help reduce the symptoms of heaves in your horse. It is important you take all measures to help keep your horse’s airways functioning as effectively as they possible can – despite heaves being present. If you have any questions or you would like further information, please do not hesitate to call Prime Stables today. Our friendly team of helpful staff would be more than happy to offer you advice.